Visiting Chicago on a budget? No need to come home broke with this 2-day Chicago sightseeing itinerary that packs in free (and cheap!) things to do in Chicago. Are you looking for free things to do in Chicago? Going sightseeing with a budget in mind is easy to do. Here is the skinny on ways to see Chicago on the cheap. From two days that cover everything from a wallet-friendly beer tasting to free neighborhood tours, to top tips on how to save money in Chicago — plan your stay with this guide. ❏ Wander around the palms and ferns at the free Garfield Park Conservatory, one of the largest and most stunning in the nation. 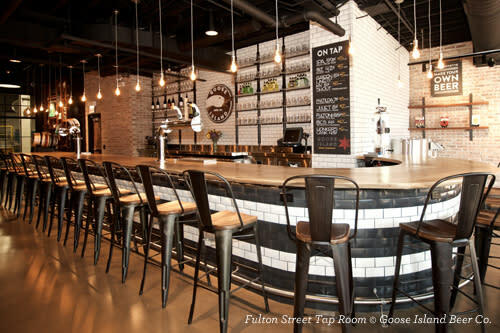 ❏ Go behind-the-scenes at the Goose Island Fulton Tap Room on a 1-hour brewery tour and tasting (three drink samples, plus a souvenir beer glass, for $12). ❏ For dinner, head to Exchequer Restaurant and Pub in the Loop for award-winning pizza and ribs. ❏ Late in the evening after the last show (except on Fridays), enjoy free improv on the famous stage of The Second City. This Chicago original has an incredible list of alumni (Tina Fey, Stephen Colbert and Bill Murray among them) so its worth the trip just to walk the hallways plastered in their photographs. ❏ Sleep well at the Best Western River North Hotel. With its central location, indoor pool, free wifi and one of the cheapest on-site parking prices for a downtown hotel, this is a great budget bet. DAY 2: A Guided Tour & Iconic "Cloud Gate"
❏ Grab breakfast to-go at downtown Intelligentsia Coffee. This cult-coffee chain has expanded beyond Chicago and is known for its pioneering philosophies... as well as its thoughtful preparations. Grab a sip and pair with a fruit or pastry from the snack case. ❏ Schedule a free Chicago Greeter visit (10 days in advance), requesting interests such as African American Heritage or LGBTQ Chicago, or choose from more than 40 interests and 25 diverse neighborhoods. Schedule at ChicagoGreeter.com. ❏ Stop at Cloud Gate in Millennium Park for a sunset photo op. 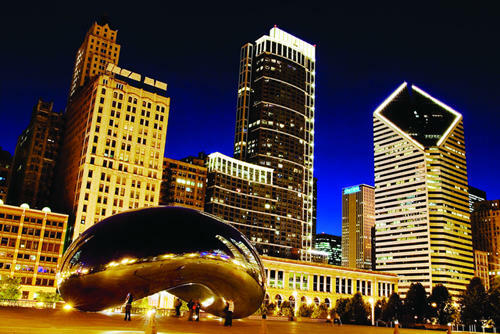 The stunning skyline-reflective sculpture (better known as "The Bean") is a sightseeing-must and the entire park is open to the public daily, no admission fee. ❏ For dinner, have Italian beef and crinkle cut fries at Portillo&apos;s. This classic combo will only set you back about $8 but leave you stuffed! 1) If you don&apos;t mind sleeping in a dorm and sharing a bathroom, staying at a hostel is on-trend. Hostelling International (HI), in the heart of downtown, offers free Wi-Fi, breakfast and linens. Lincoln Park&apos;s Chicago Getaway Hostel has many of the same amenities, but also offers some private rooms with bath. Freehand Chicago, near The Magnificent Mile, Urban Holiday Lofts and Holiday Jones are new hostels with upscale style. 2) Two of the free museums that would be worth paying for include the National Museum of Mexican Art, with its extensive works of art from both sides of the border, and the Oriental Institute&apos;s archaeological collection at the University of Chicago. 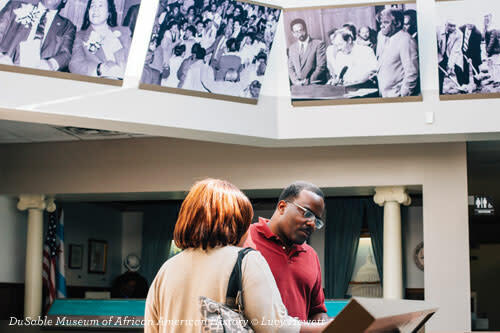 3) The DuSable Museum of African American History has free admission every Sunday. The Loyola University Museum of Art has free admission on Tuesdays, while the Clarke House and the Glessner House Museum offer free tours on Wednesdays. 4) At the Chicago Cultural Center, see not only the world&apos;s largest Tiffany glass dome, but art exhibits and stunning architecture via free guided tours. No charge. 5) Consider purchasing a Chicago CityPASS or Go Chicago Card for discounted admission at popular attractions and museums. 6) For half-price theater tickets on the day of performance, go online to HotTix.org, a League of Chicago Theatres service. Or visit one of two box office locations. 7) Getting to your destination becomes more affordable when purchasing a 3-, 5-, or 7-day Chicago Transit Authority (CTA) Unlimited Ride Pass. 8) Many restaurants just serve food, no alcohol and they don&apos;t usually charge a corkage fee for outside drinks to be brought in. These BYOB restaurants (Bring Your Own Bottle or Bring Your Own Beer) are very affordable.